Located in Chongqing, Eight miles downstream from Fenjie County, on the northern bank of the Yangtze River Yangtze River tour is White Emperor City (白帝城), also called Baidi Temple. It is an ancient temple located atop Baidi Mountain directly overlooking the Qutang Gorge, one of the Three Gorges of the Yangtze River. 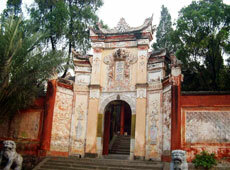 It is also the best place to overlook “Kui Gate” which is at the entrance to Qutang Gorge. Two perpendicular cliffs rear over the river surface on either side, looking like a pair of giant door leaves. White Emperor City is also known as the City of Poems because so many poets, including the Poet Immortal Libai who wrote about "Departing from Baidi in the Morning", and the Poet Sage Dufu who even resided here for nearly two years and wrote about 1,400 poems. This morning, I depart the town of Baidi, engulfed by vibrant clouds. Our little boat has already carried me past thousands of hilltops. It is said that in the late Western Han Dynasty (206 BC - 24 AD), Gongsun Shu, a general, set up a separatist regime by force of arms in Sichuan. He claimed himself the King of Shu. Because he saw white fog rising from the well of the mountain which was like a white dragon, he called himself the White Emperor. 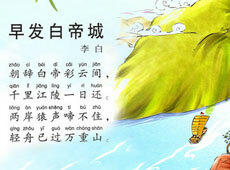 And he made it the capital city and gave the city the name - White Emperor City. At White Emperor City affordable China travel packages, in addition to visiting the numerous Ming Dynasty Era halls that house statues of the Three Kingdoms heroes, one can see an original Ba hanging coffin that is over 2300 years old in Stele Forest. Tuogu Tang (Entrusting Son’s Hall) is the most attractive one. In the Three Kingdoms Period (220 - 280), the first emperor of the Shu Kingdom, Liu Bei, failed in the battle with the Wu Kingdom at White Emperor City. He became ill and entrusted his son to his prime minister, Zhuge Liang before closing his eyes. Now, the hall exhibits the statues which depict the scene of Liu Bei entrusting his son to Zhuge Liang. Mingliang Palace is where the statue of GongsunShu was once sacrificed by the people. In the Ming Dynasty China guide, the statue was replaced by those of Liu Bei, Guan Yu, Zhangfei and Zhuge Liang. It is the place where Zhu Geliang observed the stars and developed the tactic of using arms. Other relics housed in Baidi Temple are a Stele Forest, ancient suspended wooden coffins, painting and calligraphy works by celebrities of different dynasties. Travel Note: When taking the Yangtze River cruise and reaching White Emperor City, you would take the coach directly to Baidi Temple in 20 minutes’ drive. You will have two hours for your White Emperor City visit to appreciate the rich historic story and mysterious land.